Healing Neen isn't just another story about victims and survivors or recovery and redemption; ultimately, it is a story of Good News and a testament to God's grace and presence. It is the story of a woman's path to salvation and a propitious glimpse into the potential buried deep within some of society's most vulnerable people. But this story isn't just about Neen; it's about the value of human life, the depth of suffering, and the heights of grace. It is a convincing cri de Coeur for better practices in the way we treat and counsel those caught in the cycles of trauma, addiction, and serial incarceration. Neen brings us face-to-face with the ubiquitous corruption, neglect, and abuse in some of the systems meant to safeguard at-risk women and children, yet she leaves us with hope that things can change for the better. Today, Tonier Cain's calling is to help save thousands of other "Neens" across the nation. She is a leading advocate for trauma-informed care in prisons and mental health facilities. She is a champion for examining and improving the way we help one another toward redemption, and she is the voice of compassion and promise for so many still living on the fringe who need to hear, "where there's breath, there's hope. 'Sure. Tell me what's happening with you.' I walk over to a young woman dressed in gray prison garb. I am at the Maryland Institute for Women, where I'd been an inmate. I'm here now as a featured speaker to discuss trauma-informed care. As I approach her, she begins to cry. 'I lost my five children to the system. And I need help. Kin I attend your session?' Just the mention of a mother losing her children touches my heart. I know that pain. So I ask the warden if this woman can be a part of the small group session tomorrow evening, and she agrees. I hug the woman and promise, 'If you allow me, I'll help you. I won't leave you.' I know the feeling of helplessness when the system designed to help fails. I know the despair when no one steps up to help you. It's one thing to be down, but it's another when you see no possibility of getting up, when being down becomes a way of life. I knew both. I'd been there. The next evening in a small group session, this inmate tells me of a life of abuse that includes drug use and all that goes with it. As she cries and pours out her heart to me and the other women seated in a circle, I hear my story, or at least a form of my story. And I think, But for the grace of God, I could still be here or dead. I connect this inmate to a program that will allow her to get the assistance she needs to regain control of her life. The program includes trauma therapy, which will help her identify and acknowledge the things that had been done to her that contributed to her behavior. This is my life now. I travel the country telling policy makers Neen's story. Neen is a form of my middle name that my family called me. It represents a past that almost destroyed my future; however, because of the intervention I received through trauma therapy, I emerged from that life and from the cycle the women I now speak to live in. Now I am committed to helping others break free from the shackles of secrecy that surround the abuse often caused by traumatic events. the presence of my heavenly Father. 'Life happens' is more than a bumper sticker; it's a reality that I know all too well. Life happened to me, although I didn't realize it at the time. From a very early age, people did things to me. I don't know if they singled me out or if I was just in the wrong place at the wrong time. I do know that, almost from the beginning of life as I knew it, things were done to me. As I grew older, I began to realize that the things that were being done to me were bad, but I was powerless to stop them or to get away from them. So 'life' continued to happen, and I kept living as best I knew. Life was not always easy. I'm not asking for sympathy; I'm simply telling the truth. I didn't have a good childhood, my teenage years were a drunken blur, married life was a disaster, my relationship with my mom was whacked, and the list goes on. I'd failed at so many things. I'd even failed at motherhood. But in the midst of all these happenings, I never gave up, because I believed that, as long as I had breath, there would always be a chance that my life could change. I was born and grew up in Annapolis, Maryland, home to the U.S. Naval Academy and the capital city of the state of ­Maryland. It's a beautiful city, but Annapolis is a city of opposites: rich and poor. On one side of town are the wealthy ­people with yachts and big homes. On the other side of town are the projects. Strangely enough, one exists without seemingly knowing the other exists. When I was growing up in the projects, it was all I knew. For me it is the place of my birth and the beginning of my life of pleasure and pain. There are many things from my childhood that I just don't remember. When I first became aware, I was about four years old. I was Tonier, and I lived with my mother, Barbara, and my father, Oatmeal, whose real name is Vernon Johnson. I had a sister named Bridget, and two brothers named Vernon Jr. and Carlos. We lived together in a two-story apartment in the projects. Since I didn't know any other life, I accepted what I saw and heard in my mother and father's house. Sometime early in my childhood, I learned the sounds of living. No one taught me. No one said, 'This is how you should live,' or 'This is how you shouldn't live.' I became accustomed to how my parents treated each other and how they treated us. To me, 'normal' was a life where people had fights and cussed at each other. I accepted what was because it was all I knew. Oatmeal and Barbara fought a lot. It was one of the sounds I learned to recognize early on. Oatmeal would slap Barbara and push her down, and she'd scream at him. The sound of screaming, cussing, and hitting scared me and made me feel like there were butterflies in my stomach. I'd start to shake, the feeling would move into my chest, and my heart would start to beat really fast. Then the sound of fighting would move into my head. It wasn't a loud sound, but it made my heart beat even faster, and it filled my ears. Years later when I listened to a conch shell, it reminded me of that sound. Sometimes the sound took my breath away. I remember screaming, 'Stop! Barbara! Oatmeal!' But Barbara couldn't hear me above her own voice or Oatmeal's sounds. I'd be crying; everyone would be crying. But the crying didn't stop the beating, so I learned to hide from the sound. I learned to crawl into a ball and hold my ears. It didn't help. I could still hear, and so I cried and hid because Oatmeal was hitting Barbara. I learned when the talking became the sound that started the fight. It's strange what little children quickly learn. 'Go get it!' Oatmeal's sound was so loud. 'Get it your damn self. You want it.' Then Oatmeal dragged Barbara down the hall to the bathroom. He had her by the back of the head, pulling her by her hair. 'You gone get it out of that toilet, or I'll flush you down behind it. Now get it.' I guess Barbara couldn't get the ring because Oatmeal tried to put Barbara's head down the toilet. She was screaming; he was screaming. But this time even my screaming didn't make him stop. There were a lot of scenes like this when I lived with Barbara and Oatmeal. Usually, they made up, followed by a lot of hugging and kissing. Then life went back the way it used to be until she made him mad again, and the sound would lead to another fight. I remember once we were at my grandmother Mil's house and Oatmeal punched his hand through a glass trying to hit Barbara. Years later when I learned about abuse, I knew that I'd grown up watching my father abuse my mother. Once the sound of them fighting made me so sick, I couldn't breathe. They stopped fighting, and Barbara took me to the window and held my head outside so I could breathe. It was hot, and I couldn't stop throwing up. Nothing Barbara did made me better, so she took me to a doctor, who said I had asthma. When I woke up, I was in a big white tent. Looking for a window to breathe out of, like I did at home, I couldn't find one through the plastic. Scared, I yelled, 'Barbara!' No one answered. 'Barbara!' I was really scared because I couldn't remember where I was or how I'd gotten there. There were other beds in the room, but I didn't know who was in them. I kept calling for Barbara to come and get me. I wanted her to take me home. With all my four-year-old being, I wanted Barbara. I never called Barbara 'Mama' or 'Mommie' or 'Mudear,' like the other children called their mamas. She was always Barbara. I don't know why, but my brothers, sister, and I always called her by her first name. I know now that names are important, but I was never taught to call her 'Mama' or call Oatmeal 'Daddy' or 'Dad.' All I knew then was that I was in a strange place, and I wanted Barbara. 'Barbara! Please come get me!!' But no one came to answer my call. I couldn't understand why Barbara would leave me. Didn't she love me anymore? 'I love you, Barbara. I love you. I'm scared. Please come get me.' After a while, I learned that no one would come when I cried, but it didn't stop me from crying. Why were they doing this to me? Why? ©2014 Tonier Cain. All rights reserved. 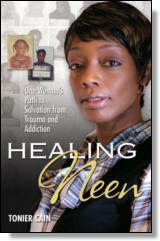 Reprinted from Healing Neen: One Woman's Path to Salvation from Trauma and Addiction. No part of this publication may be reproduced, stored in a retrieval system or transmitted in any form or by any means, without the written permission of the publisher. Publisher: Health Communications, Inc., 3201 SW 15th Street, Deerfield Beach, FL 33442.